Posts about influential books are pretty common. Writers discuss stories that inspired them, helped them work through dry spells, challenged them to become better. Some lists are chock-full of literary classics. Others are whimsical, with favorite books featuring dogs, or cake baking, or cake-baking dogs. My list is in-between, five books that are the equivalent of comfort food, or favorite recipes. These are the books I revisit consistently. Sometimes I reread from the beginning; other times, just a favorite scene or story. I want them with me on that desert island, that journey to Mars. Naked Once More is the 4th and final book in Elizabeth Peter’s series featuring librarian-turned-romance author Jacquelyn Kirby. In this entry, Kirby competes with other authors for the chance to finish a manuscript started by Kathleen Darcy, a young woman who wrote one mega-bestseller and then vanished, an apparent suicide. 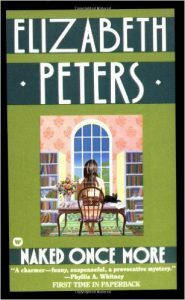 I still have the paperback I bought in the early 1990s, around the time I started writing for publication. Because I knew next to nothing about the publishing world, I found Kirby’s observations informative, daunting, amusing. Later, I developed quite a bit of sympathy for Darcy, the character around whom the story revolves. I recalled sensing a little of the resentment she experienced as she sought to juggle family life and writing life, the desire for that “room of one’s own.” In short, I found this book at a time when I kinda needed it. Since then, I’ve tried to read the other Kirby stories, but have yet to finish them. None of them hooked me as did Naked. But I like Jacqueline Kirby, so I will keep trying. Good Omens. What can I say? Gaiman and Pratchett, a perfect melding. I enjoy all the characters, but my favorite sections are the ones featuring Aziraphale and Crowley. I can hear them bicker. I adore their bickering. My internal casting director long ago cast Ian Richardson as Aziraphale and a twenty-something Rupert Everett as Crowley, but now I think Peter Capaldi and Benedict Cumberbatch would also fill the bill. 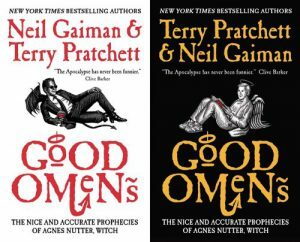 Here’s a link to a BBC interview with Gaiman about how Good Omens came about. Danse Macabre. Stephen King is almost as well known for his books on writing as he is for his horror and fantasy. 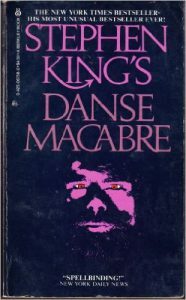 Danse was his first excursion, published in 1979. Like his other nonfiction books, it’s part autobiography, part horror discussion and critique. What scared him. Which films, television series, and stories inspired or, in a few cases, disappointed him. His extended discussions of books such as The House Next Door and Ghost Story, both the film and written versions of works such as The Haunting of Hill House, provide valuable insight into scary story construction. The autobiographical sections about his youth, his absent father, the struggles and the success, offered inspiration, a case study of writer development. 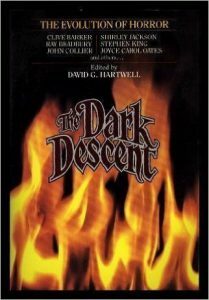 The Dark Descent, edited by David Hartwell, came out in the 1980s. A history of the dark suspense and horror genres, it contains stories from the 1800s to the 1980s, some of which are among my favorite short stories. These include “Sticks” by Karl Edward Wagner, which I believe was one of the inspirations for the film “The Blair Witch Project,” and “The Autopsy” by Michael Shea. “Crouch End” and “The Reach,” both by Stephen King. “Vandy, Vandy” by Manly Wade Wellman. When I yearn for a comfort scare, I reach for this book. Yes, there are such things as comfort scares. 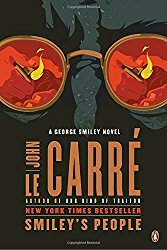 Tinker Tailor Soldier Spy/Smiley’s People by John Le Carré. I know, two books. But to me, they’re a single work, a tight weaving that I can’t tease apart. My Lord of the Rings. 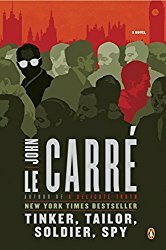 As I was writing the Jani Kilian books, I reread sections over and over, soaking up Le Carré’s descriptions of the spy’s life and the types of personalities it attracts, the intelligence bureaucracy and infighting. He also writes marvelous, moody descriptions of settings. There’s an extended scene at the end of Smiley’s People in which George Smiley and others wait at one end of a Cold War Berlin bridge for a defector that I think is a perfect combination of setting, mood, and action. So, those are my indispensable books. What are yours?